The Seven Boyars (Russian: Семибоярщина, the Russian term indicating "Rule of the Seven Boyars" or "the Deeds of the Seven Boyars") were a group of Russian nobles who deposed Tsar Vasily Shuisky on 17 July 1610 and, later that year, invited the Poles into Moscow. The seven were Princes Fedor Ivanovich Mstislavskii (the leader of the group), Ivan Mikhailovich Borotynskii, Andrei Vasilevich Trubetskoi, Andrei Vasilevich Golitsyn, Boris Mikhailovich Lykov-Obolenskii, and Boyars Ivan Nikitich Romanov and Fedor Ivanovich Sheremetev. Due to the Polish advance into Russia, the Bolotnikov rebellion, and other unrest during the Time of Troubles, Shuisky was never very popular, nor was he able to effectively rule outside of the capital, itself. The seven deposed him and he was forcibly tonsured a monk in the Chudov Monastery in the Kremlin. He was later carried off to Poland where he died in prison at Gostynin in 1612. On 17/27 August, the seven agreed to accept Władysław as Tsar of Russia. The Poles entered the city on 21 September. 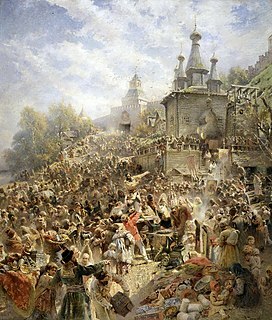 While some consider the rule of the Seven in Moscow to have lasted only from about June 1610 until the arrival of the Poles in September, others consider their rule to have lasted until the Poles were driven from Moscow by the popular movement headed by Kuzma Minin and Prince Dmitry Pozharsky in 1612. Their power to act after September 1610, however, was rather nominal. ^ Robert O. Crummey, The Formation of Muscovy 1304–1613 (New York and London: Longman, 1987), pp. 224–5. The Ingrian War between Sweden and Russia, which lasted between 1610 and 1617 and can be seen as part of Russia's Time of Troubles, is mainly remembered for the attempt to put a Swedish duke on the Russian throne. It ended with a large Swedish territorial gain in the Treaty of Stolbovo, which laid an important foundation to Sweden's Age of Greatness. Prince Mikhail Vasiliyevich Skopin-Shuisky was a Russian statesman and military figure during the Time of Troubles. 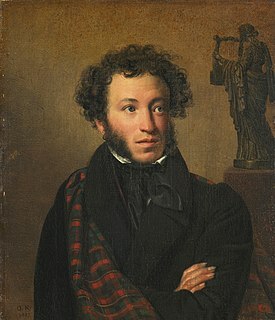 He was the last representative of a cadet branch of the Shuysky family. Repnin, the name of an old Russian princely family of Rurikid stock. The family traces its name to Prince Ivan Mikhailovich Obolensky (+1523), nicknamed Repnya, i.e., "bad porridge". 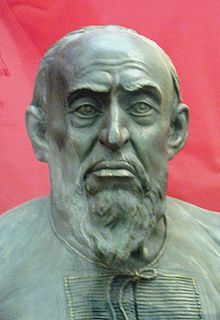 Like other Princes Obolensky, he descended from Mikhail Vsevolodovich, prince of Chernigov, who, in 1246, was assassinated by the Mongols.